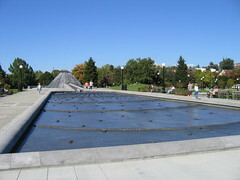 The water feature above the water of the reservoir in Cal Anderson Park, (cc: flickr user djwudi). filtration systems, new “land” is being created for parks in several cities around the country. The article discusses some of the tracks taken by other cities to keep or open up reservoir sites to the public, including preserving them as water features. Given the fact that they occupy large tracts of land, the idea of co-locating parks makes a good deal of practical sense.